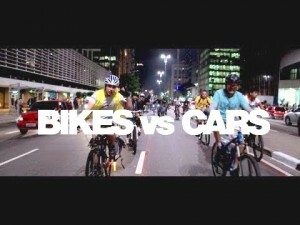 In the documentary film, Bikes vs. Cars (2015), director Fredrik Gertten takes a deep look at a problem all highly-populated cities face: those dreaded traffic jams, over-population, pollution, pedestrian and cyclist deaths, and the role corporate interests have in urban planning legislation within today’s globalized economy. If you are looking for a documentary that’s oozing with progressive, passionate people and lacks the typical talking heads often found in documentaries, award-winning director Fredrik Gertten’s Bikes vs. Cars is a compelling watch. Fredrik Gertten, also known for his films Bananas! (2009) and Big Boys Gone Bananas (2012), filled me in on his inspiration behind the film. The film follows stakeholders around the world from bike activists to urban planners and architects, a taxi driver in Amsterdam, to classic car enthusiasts. Most notably, the film captures Aline Cavalcante, student and bike activist in Sao Paulo, Don Koeppel, an avid bike rider in the L.A. area, Raquel Rolnik (urban planner), Ricardo Correa (architect), and from the car perspective, Joel Ewanick (former Marketing Chief of Hyundai, General Motors, and Porche) who proclaims that even the motorists want less noise, traffic, and pollution. Within each of these people, the story of transportation and their cities unfolds as the film digs deeper into how we got to the crowded, car-oriented transportation mess of today. We also visit the nostalgic nature of the good ol’ biking times of yesteryear. 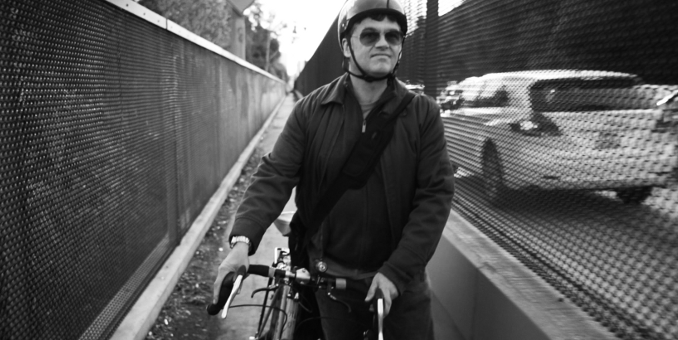 To give you an idea, Dan Koeppel, a writer and bike enthusiast in L.A., walks around and shows the audience a cyclist highway that once connected Pasadena to L.A. We see the cyclist bridge covered with weeds and overdevelopment juxtaposed with a glimpse of footage from the early 1900s to see smiling folks riding their bikes to work on the cyclist highway to composer Florencia Di Concilio’s sprightly music. We learn about the oil, gas, and car corporations’ interests in planning for large, highway systems and how, along the way, public transportation and bicycling were pushed aside. 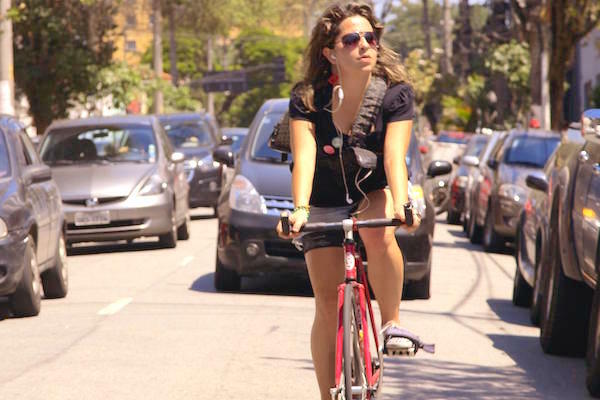 The film also zeros in on Aline Cavalcante, a student and bike activist in São Paulo, Brazil, weaving through noisy traffic on her bike. The emotional impact of cyclists being pushed aside is felt loud and clear as Aline learns of cyclists’ deaths due to accidents on the road. We see Aline attempt to gather young people like her who ride bikes. Aline gathers momentum with new tools like social media to create positive change for cyclists in São Paulo, the city she loves so much. I was impressed by these vibrant and authentic lives the film glimpses into, so I asked Fredrik how he goes about selecting whom to follow in a documentary. In each city, from L.A. to São Paulo, to Toronto, the movie shows that problems seem to be the same. The silver lining of this story seems to come through when the audience is taken to visit Copenhagen, one of the most bike-friendly cities in the world. Bicycle rush hour ensues and we watch the bikes zip around the streets like ants to that same spritely music. Copenhagen has been historically rated as one of the happiest cities in the world. Coincidence? The way the film was presented left me captivated, angry with my own commute (Urban sprawl is really not my fault! ), and sentimental in remembering that blissful feeling and energy from biking to work. It left me wondering, “Why can’t we all live in this clean-air, happy, biking Utopia?” Well, we could, and Bikes vs. Cars shows that we can impact the future of our environment if we give ourselves a voice. Bottom-Line? Bikes vs. Cars is a must-see for any bicycle, city planning, or climate-change enthusiast. The film drums up authentic and engaging stories, problems, facts, and mixes in the fun of youth and biking. Cast: Dan Koeppel, Aline Cavalcante, Ivan Naurholm, Raquel Rolnik, Nicolas Habib, Don Ward, Gil Peñalosa, Rob Ford, Joel Ewanick, Joshua Dysart, Denzil Minnan-Wong, Christina Deckwirth, Liliana Godo, Fabio Mendonça.